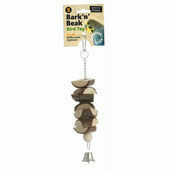 Natural wooden toys for birds and parrots in a range of shapes and sizes. 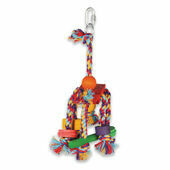 Our wide range of wooden bird and parrot toys and ladders are a safe way to keep your bird entertained and stimulated. Wood is an ideal material for bird cage accessories and toys, proving safe and durable even for birds who like to peck and scratch. Available in natural or bright colours, they're available in a huge range of shapes and sizes suitable for any species of bird, and will also help to keep your birds beak and claws in top condition.